On Monday, Marvel started screening their inter-galactic superhero sequel Guardians of the Galaxy Vol. 2 for the press, with the world premiere screening held just last night, as the countdown continues towards the May 5 theatrical release. It was revealed shortly after the first screening that there are a whopping four post-credit scenes, but director James Gunn actually clarified on social media that there are really five post-credit scenes with one being withheld from the press. The studio junket wrapped up today with a press conference, where Marvel Studios president Kevin Feige and director James Gunn made some intriguing revelations about the iconic Adam Warlock and the original Guardians of the Galaxy. There will be SPOILERS for the post-credits scenes below, so read on at your own risk. Of the four post-credits scene shown to journalists and those who attended the Guardians 2 world premiere, one involves Stan Lee's cameo while another involves a big spoiler for the movie that shouldn't be mentioned right now. 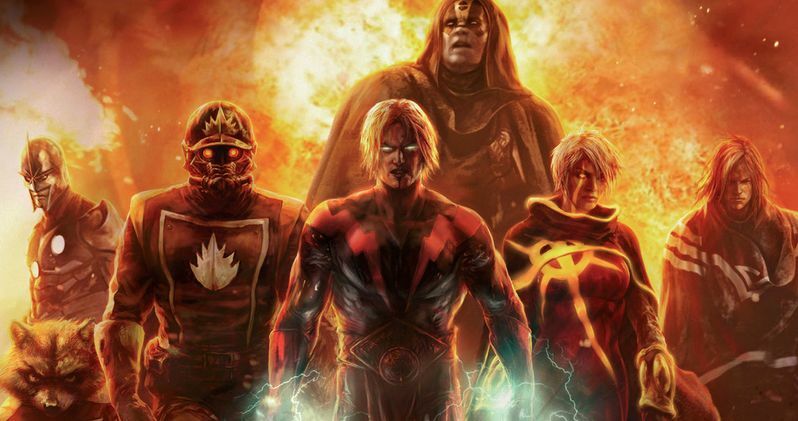 Another one, however, shed some light on the future of the Marvel Cinematic Universe, giving fans a glimpse at Adam Warlock. While it isn't known who is playing this iconic character yet, it was long believed that Adam Warlock was a character that James Gunn mentioned he had cut from the "treatment phase" of the movie. The filmmaker spoke with /Film, where he revealed Adam Warlock was the character he cut out of the treatment, and decided to save him for another movie. "I love Adam Warlock. He's one of my favorite characters. In all truth, I wrote an early treatment where I had Adam Warlock as a part...this is your big scoop, because I don't think I've told anybody this... It was Adam Warlock. He was a big part of the screenplay and I realized it was one character too many. And I adored the character. I adored what we had done with him. I think we did something really creative and unique with Adam Warlock. But it was one character too many and I didn't want to lose Mantis and Mantis was more organically part of the movie anyway. So I decided to save him for later." It was also confirmed that Adam Warlock won't appear in Avengers: Infinity War, but he will most certainly be back at some point in Marvel's Phase 4 lineup. One of the other post-credits scenes offers another treat for long-time comic book fans, bringing together the original Guardians of the Galaxy lineup, which comes into play when it is revealed that Yondu, who in the comics is an original Guardian, had a team of his own long before meeting Peter Quill. It is revealed in this brief scene that Ving Rhames is playing Charlie-27, with Chinese action icon Michelle Yeoh coming aboard as the "female Starhawk," Aleta Ogrod, alongside Sylvester Stallone's Stakar Ogrod. Here's what Kevin Feige had to say, confirming they are the original team. "They're definitely the original Guardians. That was the fun of it and when James had the idea to do more with the Yondu character, who is also an original Guardian, there was the notion that he had a team once like Peter does now. That'd be fun to see them. And Ving Rhames is definitely Charlie-27." When a journalist asked who "the red alien guy" is, the director confirmed that he isn't in the credits, but that character is Krugarr, with Mainframe rounding out the team. James Gunn wouldn't reveal who is playing Krugarr or Mainframe, but the filmmaker did tease in a recent interview that actor Michael Rosenbaum does have a "decent role" who "works in tandem" with Sylvester Stallone's character, so it's possible that he's playing one of those roles. The director also confirmed that all of these characters are merely being introduced, in hopes of bringing them further into the Marvel Cinematic Universe. James Gunn also recently confirmed that he is coming back to write and direct Guardians of the Galaxy 3, which will most certainly be part of Marvel's Phase 4 lineup. It certainly seems possible that some or all of these characters will return in Guardians 3, but it's too soon to tell. With just over two weeks left until Guardians of the Galaxy Vol. 2 hits theaters, hopefully we'll get some more secrets that tease the future of the MCU in the days ahead.